Lower Lonsdale in North Vancouver is home to a handful of great healthy lunch spots: Tao Organics, Buddha-full Cafe and my latest discovery, a deli-style cafe called plantoplanto located on East 2nd Street. 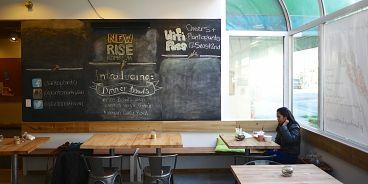 Touting themselves as “mainly plant-based”, this dine-in/take-out eatery offers sandwiches, soups, smoothies, healthy desserts (like chia pudding) and salads (or “sides” by the scoop). Everyday they offer a choice of 8 different gluten-free vegetarian selections that you can mix and match. Try the carrot walnut or the quinoa kale — both were tasty, hearty and not overly-rich. Plantoplanto’s sandwiches are served on warm ciabatta bread. Choose from ‘Pear Cranberry and Chutney with Brie’ or ‘Roasted Veggies with Spinach Pesto and Brie’, or my personal favourite, the ‘Smoked Tofu’ which is simple and delicious.